Pocket Rockets Casino underwent a major overhaul and launched a new website that is a complete improvement from its previous versions. Two years after it originally debuted in the Bitcoin gambling industry back in 2013, this website now features competitive products and services that easily catch the attention and interest of its current and potential customers. Leaving its past as a Bitcoin poker/blackjack/and sportbook, but still carrying over the Bitcoin dice game, this casino promises provably fair gambling that is highlighted by a low house edge. This combination definitely adds up to the site’s overall appeal, which translates to its constantly growing player base. Pocket Rockets Casino boasts an improved game selection that includes Bitcoin roulette, dice, and lottery. Although this clearly shows the lack of the usual casino favorites like slots, what it has now are enough to create a decent to excellent gambling experience online. The dice game here employs the typical Roll Hi and Lo feature, which is simply a love-it-or-hate-it game. Many players are already familiar with it, and there are already dozens of Bitcoin dice sites with this type of game. But as the cliché goes: whatever rocks your boat. Its roulette, on the other hand, is a European version that shows an actual table and a spinning wheel. The animation and graphics are high-quality, but those looking for more betting options like the French bets may get a little disappointed. If there is one game that looks promising, however, it would be the Bitcoin lottery game on this site. It requires players to buy tickets, but they can choose how many numbers to play. Draws are scheduled every day, and the tickets can be purchased 10 minutes before the draw. This Bitcoin casino definitely has more reasons to attract gambling enthusiasts. Add to its games the convenient and modern way of registering accounts. 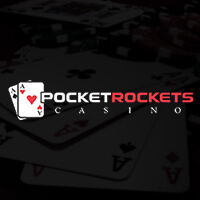 As a matter of fact, players can skip the part of inputting details during sign up because Pocket Rockets Casino enables anyone to play the games right away. It automatically creates an account and provides a unicoin login URL, but there is always an option to protect the account with a password. What many bettors will appreciate is that they can provide an emergency wallet address in case of unwanted problems, as well as to enable two-factor authentication to add another layer of security. Another factor that will truly make anyone’s gambling experience here very light and comfortable is its user-friendly payment system. Depositing funds are processed within minutes since only one network confirmation is required. Also, a transaction fee of 0.0001 BTC is needed for every withdrawal. Moreover, it features a Bitcoin faucet that rewards 0.000004 BTC to every player whose balance is zero. Apart from this, players can invest in the Bitcoin dice game, change the theme of the betting interface, and earn up to 30% of the revenue from the referred players monthly. Overall, Pocket Rockets Casino has done a fantastic job with its revamp. Its features are more engaging and beneficial to the players, and its games offer more entertainment than before. With an active social presence, this Bitcoin casino is guaranteed to reach more players without question.